This book is perfect — jam-packed with games and lists, it’s also the most user-friendly book we’ve ever seen! Who knows what you’ll love more? Maybe it will be the clean layout that specifies space prep minutes, player prep minutes, performance minutes, and number of players for every single game. Or maybe it will be the appendices, where each of the 71 games is cross-referenced by not only these details just mentioned, but also dramatic skills and National Theatre Standards by grade! Perhaps you’ll best love the CD-Rom which includes printable PDF files of every list in the book. Read more...You can even print these lists directly onto labels or pages for student use. Besides directions and examples, every single game also has tips on side coaching and evaluation and critique. It just doesn’t get better than this! This mother lode of rich activities will be mined by drama teachers in search of memory jogs and new inspirations for years to come! 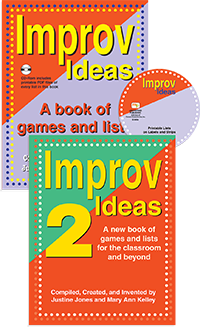 You’ve loved their first two best-selling books on improv for the classroom, so these two fabulously creative and entertaining devotees to theatre have done it again! All the best from those two top-selling books is still here, yet this book is organized into three sections to help you even more: warm-ups, characterization, and narrative/plot. Each chapter contains an easy-to-read chart of all the activities that indicates how much preparation time is needed, what skills the game enhances, the difficulty, the length of the exercises, and more to help you plan your lessons at a glance. The side margins of each game include all the information from above and how many students are needed for each activity, the equipment required, the time it takes to set up the game, and how long the students will need to prepare. Each game is introduced with simply-worded directions and examples, and is followed by hints for evaluation and critique. Finally, the appendix includes multiple charts that align the games with the National Standards for Theatre Education. This book is an invaluable resource for inspiring your drama class! SPECIAL OFFER! Buy both books for $37.00! Cross-referenced and indexed twelve ways from Sunday, this book provides not only the standard lists of improv excercises, but also sections on critiquing, further challenges, huge lists of examples, and the biggest bonus for me were the invaluable ‘Side Coaching’ ideas... Wonderful lists of techniques to get the games unstuck. Ken Bradbury, national speaker on writing for theatre and co-author of Shadow of Giants, the Lincoln courtroom drama aired on PBS - TV.